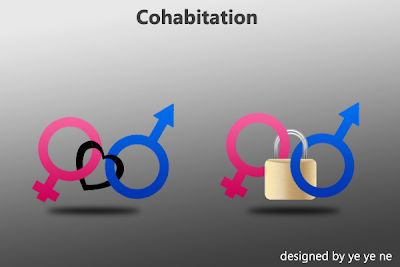 Cohabitation is an arrangement whereby two people decide to live together on a longterm or permanent basis in an emotionally and/or sexually intimate relationship. The term is most frequently applied to couples who are not married. //Now, We are trying to make images for the post in order to read from phone which cannot use Zawgyi -one fonts from the browser. I also hate to jailbreak the phone and also hate to see myanmar fonts in squares. Someone should inform Apple to add Myanmar Language in default keyboard and font. Thanks ye ye ne for his design. We thought a lot to get a suitable image for the post. We don't want to distribute misleading concepts to youths .That's why we tried to present our thoughts frankly in this post. But don't worry I will not post the philosophy of marriage or whatever concerned to it. Coz I don't believe in any sort of so-called relationship. I hate the term "legal" ... .
Let me say a joke. In California, it takes 6 months to divorce and it only takes 15 days to buy a gun. So .... for citizens, the government makes the solution to be easy ... do you wanna wait to divorce or choose the faster way ...That's it!! we rejected not because of we see it is wrong but because of it conflicts with our traditional point of view. I am sorry for not allowing comments section in my blog. But I love to discuss with my close friends and with elders for various issues. I do respect to readers who read and digest data into information. I will never make a conclusion for everything I believe. And will never say what I believe is the universal truth. Thanks for reading a long post and notes.